Remember the beneficial effects of healthy diet and regular exercise. Women who exercise and follow a healthy diet cope better with menopausal changes and also help protect themselves against other diseases such as heart disease and osteoporosis. A healthy diet should include 5 portions of fruit/vegetables per day. Try to include unrefined foods as much as possible, rather than refined convenience foods. Take high fat and sugar containing foods in moderation and don’t take too much caffeine or alcohol. Being overweight has been shown to worsen flushes and increases the risk of heart disease and diabetes. Losing weight has been shown to reduce the risk of breast cancer (see news item). Try to maintain a healthy Body Mass Index (BMI). Excess caffeine and alcohol not only worsen flushes but also increase the risk of osteoporosis. We should all make exercise a priority and build it into our daily routine. Regular exercise not only helps with weight loss but also reduces flushes (SEE ALSO: Menopause News - exercise is good), reduces the risk of heart disease and weight bearing exercise reduces the risk of osteoporosis. Increasing exercise has also been shown to reduce the risk of breast cancer (see news items from 2006 and 2010). Many women join a gym for the first time in their 50s, which works for some but you don’t have to - brisk walking is a great form of exercise and is free! » See the monthly videos from our exercise contributer, Katie Morris, Fitness Instructor. Women who smoke have an earlier menopause than non-smokers, have worse flushes and often don't respond as well to tablet form of HRT. It’s never too late to stop smoking! Use this time in your life to start living a better healthier life. Most women taking a healthy well balanced diet obtain sufficient vitamins and minerals required and do not need to take supplements. However many women nowadays have hectic lifestyles and do not always get everything they need from their diets on a daily basis, this is especially true when women are trying to lose weight, perhaps avoiding some essentials in their diets. Some vegetarians can also be at risk of not obtaining enough nutrients in their diets. Some of our Western World diets are deficient in some minerals not just because we do not eat the right foods, but also because the food growing techniques mean that the food may not be as good quality as it used to be. Vitamin B group. Most women following a Western diet are unlikely to be deficient in this group of Vitamins as they are added to flour (fortified). Certain B vitamins are more likely to be difficult to obtain from dietary sources, such as Vitamin B5 and Vitamin B6 (pyridoxine). Supplementation of vitamin B6 has been recommended for women who suffer from Premenstrual syndrome. Vitamin B6 may have a role in the prevention of heart disease by lowering harmful homocysteine levels, which are associated with heart disease, stroke, osteoporosis and Alzheimer’s disease. Vitamin C. Deficiency of Vitamin C is unlikely in a balanced diet containing fruit and vegetables. It is more likely in smokers and those not eating fresh produce. Some believe that it can fight off colds and flu in high doses. It works as an anti-oxidant. Vitamin D. Vitamin D is required to maintain bone health. It helps the body absorb calcium and is made in the skin due to sunlight action. Lack of sunlight due to poor climate, people being housebound, or being covered up when outside, often leads to lack of vitamin D, particularly in the elderly. Dietary sources include oily fish, dairy products and margarine and 2 main course portions of oily fish per week are recommended. Vitamin E may have a protective effect against heart disease and supplementation is recommended. It has been found to reduce the number of non-fatal heart attacks, but not fatal ones. A dose of 400-800 iu is suggested. Some women find that high dose Vitamin E helps with night flushes. It is also known for its beneficial effects on skin and hair. Calcium. During the menopause, an adequate daily calcium intake is especially important to help protect and maintain bone density as bone loss accelerates. See below for recommended intakes at different stages of life and calcium content in foods. Supplements of Calcium and Vitamin D can be taken if the recommended amount is not achieved but the body copes best with a dietary source of calcium. Calcium calculator. You can find a daily dietary calcium calculator here and see more information below about dietary calcium. Phosphorus is a necessary nutrient and typical diets are unlikely to be deficient. Magnesium supplements of at least 250 mg per day may help prevent bone loss. Lack of it has a possible role in premenstrual syndrome and ME. Iron deficiency is relatively common in women still having periods, vegetarians and pregnant women. It is not recommended to take excess supplements of iron unless the deficiency is proven. Zinc helps with skin repair and damage and also promotes a healthy immune system. The dose should be small to prevent any overdose of the substance. Copper supplements should be taken along with the zinc. Copper. Small doses of copper can possibly prevent bone loss. Manganese. A highly processed diet of convenience food could result in low levels of manganese intake. Iron and manganese are best taken together. Selenium. Supplements of selenium have been associated with a reduction in cancers. Higher amounts of selenium than are available in the diet may be necessary for this protective effect. Taking a balanced, healthy diet will provide the vitamins and minerals required and is the best way to stay healthy but some women choose to take a supplement, of which many are available. calcium is a nutrient that we know has an important role to play in the maintenance of bone health. This Information Sheet contains a selection of calcium rich foods, which, as part of a well balanced diet, may contribute towards an adequate intake. The Governments Committee on the Medical Aspects of Food and Nutrition Policy (COMA), now replaced by the Scientific Advisory Committee on Nutrition, sets recommended levels for nutrient intake (Reference Nutrient Intakes) for the UK population. The lower reference nutrient intake (LRNI) for calcium is 400 mg and the RNI is 700 mg for adults. This means that your calcium intake must be over 400 mg and it is recommended that your intake be above 700 mg to be compatible with bone health in the normal population, as based on current evidence. There is inconclusive evidence that more calcium may be needed but further research is necessary. If you have been diagnosed with osteoporosis, you may need to boost your calcium levels to approximately 1200 mg for adults and consequently may be given a calcium supplement with your treatment. 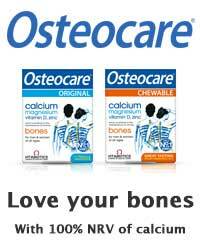 In the trials that have shown bisphosphonates to reduce fractures, the calcium supplementation used was 500 - 1000 mg. Therefore, extra calcium may be taken as part of the diet or as a supplement but the upper limit must not be exceeded. It is recommended that you do not exceed more than 2000 - 2500 mg of calcium a day. Exceeding the upper limit of 2000 - 2500 mg calcium could lead to medical problems including milk alkali syndrome (a high level of calcium in the blood) and may interfere with the absorption of other minerals such as iron. Does it matter if I do not meet the exact daily amount? It is important to remember that calcium intake should be looked at over a period of monthly intake rather than daily. A low calcium intake on one day, when most days you achieve more, will not have a detrimental effect on your bone density. Do I need to supplement my diet with any other nutrients? Other nutrients and minerals are also important but a well balanced, mixed diet including fresh fruit, vegetables, adequate protein and carbohydrate foods should contain sufficient amounts of the necessary nutrients. Some individuals may feel that they are not obtaining the calcium they need from their diet and there is no way that this can realistically be achieved. In such cases, supplemental calcium may be useful. Your local pharmacist is often an excellent source of information on over the counter products. There is evidence that older people can benefit from supplemental calcium and vitamin D and this is a useful treatment for osteoporosis in this age group. What else can affect my risk of osteoporosis? Dietary issues are just one of a variety of important components, which together, can influence an individuals osteoporosis risk. These include exercise levels, hormonal status, corticosteroid use, body stature, strong family history and previous minimal trauma fracture. General advice to anyone who wishes to minimise the effects of osteoporosis includes taking a well balanced, calcium rich diet, avoiding smoking or excessive alcohol intake and taking regular weight bearing exercise. Please note, the calcium contents (with the exception of milk and bread), have been calculated per 100 g and are therefore not portion size. This has been done to make comparisons between various foods easier. Ref: Information provided courtesy of The Royal Society of Chemistry, Ministry of Agriculture, Fisheries & Food publication "The Composition of Foods" 1992.